I don’t know what his name was or who he belonged to. This I did know – he made my runs feel like a breeze. The park where I run at every weekend is a wonderfully lush area of green, cosily nestled in a neighborhood that’s not too far from mine. It is also a bit of a petting zoo. And who can blame me for thinking so, the scene was such. Pigeons would flock in by the dozen for bits of bread crumb that children would throw. Fish and small turtles populate the lake, occasionally popping their heads out of the water for grub tossed in by the public. Monkeys dangle from the branches of trees overhead whilst the younger (and naughtier) ones scamper playfully on the metal rails surrounding the lake. Occasionally you’ll see an exotic bird or two further up in the trees, as I had once witnessed when a gentleman manning a sophisticated-looking telescope amicably invited me to look through the lens as I was jogging by. And then there was Tom. Or at least that’s what I called him. He was a short-haired brown cat with tiger-like black stripes that made regular appearance at the park and my, what a handsome fellow he was. His coat of fur was so shiny, clean and well-maintained that I thought surely he belonged to someone. 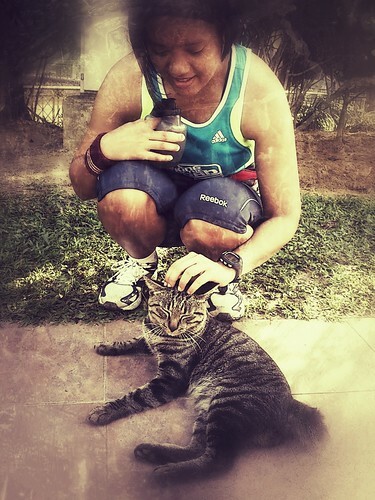 Even if he was a stray cat, he was a super incredibly friendly one at that. Tom was a regular fixture at the park. So regular that he’s garnered a few loyalists – I’ve seen a couple of folks bringing dry cat food and setting it on the ground for Tom, and then going off for their morning walks. Tom would of course eventually come and have a gleeful go at the free nosh. Once full, he’d plonk himself in the middle of the tiled area facing the main entrance, and as joggers and runners pass by, he’d pretend not to notice them. That was of course until people stopped and hands reached down to pet his head or stroke his body. Of course what sane kitty could refuse attention like that. I myself was guilty of provisioning this affectionate service. And so it became a ritual for me upon completing one loop around the park, I’d reach Tom (if he was still stationed where I last saw him), bend down and give him a rub or two on his noggin, and then be off again for the next lap. It was insanely addictive. Every time I left him I couldn’t wait to see him again, there was an unexplainable magnetic pull and motivation for me to quickly finish up my intervals just so I could see him again. Maybe it helped that I adored cats. And he’s never alone much when I do see him too – kids fawned over him, and the adults are just as enamored by the presence of this one mysterious cat, all waiting for their turn to have a personal moment alone with the feline. Tom seemed to like women a lot more and he’d rub against your legs if he liked you, maybe because women were more likely to give him the time of day. Occasionally he’d nibble on some hands he didn’t prefer – so if Tom actually takes kindly to your petting, you knew you were special to him. Like me, Tom seemed to make it a point to be at the park on the weekends. and he was clearly something I very much looked forward to whenever I laced up for the great outdoors. So you can imagine my devastation when earlier this year I stopped seeing him around, and no longer did I see the usual pile of dry cat food that was always there to greet him. I never knew if he met with an unfortunate fate and I can’t bear the thought of anything happening to him. So Tom, wherever you are – thank you for enriching my weekend running experience and for the loving extension of friendship that only cat lovers can understand. I miss you. Tom sure knows his way around the ladies. @myindodotcom from a fellow cat person, I enjoyed reading your latest post! 🙂 I’m sure Tom’s in good hands somewhere. @creepy_witch Thx babe, u’re quite early reading it, haven’t tweeted abt it yet hehe. Yeah hope Tom’s somewhere safe. Runs r not the same.